After defeating Delaborde at Roliça on 17th August 1808, Wellesley's next concern was to protect the landing of reinforcements at the mouth of the Maceira river, west of Vimeiro. Junot, having left Lisbon on the night of the 15th, drew together the divisions of Delaborde and Loison at Torres Vedras and, on the night of the 20th, marched to the attack. On the night of 20th August, Wellesley's army was concentrated on the ridge stretching west from Vimeiro to the sea, with its left occupying the hill in front of Vimeiro village. Towards 9am on the morning of the 21st, Junot's army was revealed in dense clouds of dust to be manoeuvering east of Vimeiro so as to threaten the British left flank. Wellesley had ample time to counter the threat by moving the bulk of his forces from the western ridge to the ridge running north-east from Vimeiro through Ventosa. Junot's plan evolved into a divided attack in which his main force would be thrust against Vimeiro Hill while Brennier's brigade was sent northwards to turn Wellesley's left. Prompted by the sight of British troops occupying the Ventosa ridge in force, Junot then dispatched Solignac northwards in support of Brennier. The first French attack was launched against Vimeiro Hill. The brigades of Thomières and Charlot, advancing in columns and screened by tirailleurs, gradually pushed the thick British skirmishing line back from the foot of the hill, only to be sent reeling by the fire of the enveloping lines of British infantry from Fane's 6th and Anstruther's 7th Brigades. Left: View of Vimeiro Hill from the west. Undaunted, Junot renewed the attack by sending two battalions of St. Clair's grenadiers against the mid-point of the British line on the hill. Again the British infantry threw back the attack by converging so as to pour fire into the French column from three sides. In desperation, Junot threw the remaining two fresh battalions of Maransin's grenadiers directly against Vimeiro village, only to see them caught in fire from both flanks as Wellesley ordered four companies from Acland's 8th Brigade to move down from the Ventosa ridge. After vicious, close-range fighting in the streets of the village, the grenadiers were compelled to retire. 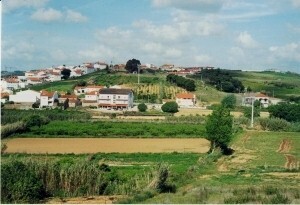 The actions at Vimeiro Hill were virtually at an end before Solignac and Brennier came into contact with the British forces in the area of Ventosa. Both brigades had been forced to move further to the north than Junot had anticipated in order to avoid the ravine that runs below the ridge. That the brigades had lost contact with each other merely compounded the problems of an already disjointed attack; whereas Solignac chose to climb the slope below Ventosa, Brennier continued to move northwards in search of an easier route. 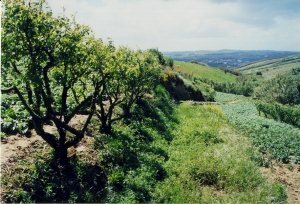 Right: View from the head of the ravine close to Ventosa. Reaching the crest of the ridge, Solignac's brigade was met by the shattering musketry fire of Ferguson's 2nd and Nightingall's 3rd Brigades. Reduced to confusion, the French ranks first faltered, then fled as the British lines advanced. It was only now that Brennier finally arrived on the field of battle, momentarily gaining some advantage before been thrown back in turn. 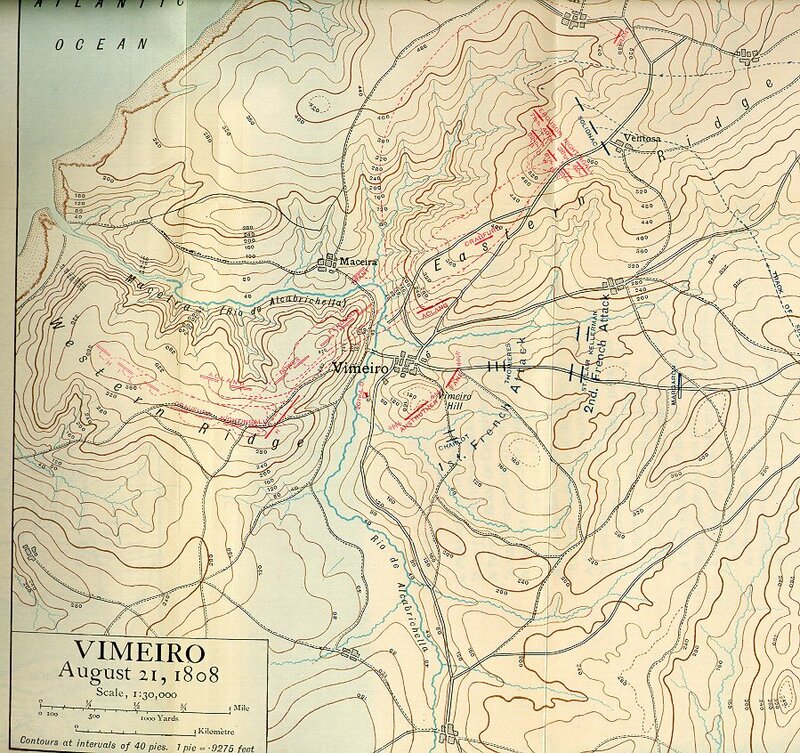 By midday, the battle for Vimeiro was at an end. Out of a force of some 18,800, British and Portuguese casualties numbered only 720. In contrast, French losses were estimated at 2,000 from a force of 13,050; at least 13 of their 23 guns had been captured. The opportunity for the British-Portuguese army to follow-up the victory with an advance on Lisbon was lost as Wellesley ceded command to the overly-cautious Sir Henry Burrard. A visit to Vimeiro can be accomplished in a short day-trip by car from Lisbon. Entering Vimeiro on the Torres Vedras road, turn immediately right following the signpost to the monument. After a few hundred metres, turn right again (signposted) and climb Vimeiro Hill to find the monument to the battle at the crest. A fine map of the battlefield, drawn on ceramic tile, stands close-by. Although the ground over which the French columns advanced is still largely clear, housing developments are beginning to encroach onto the slopes where the fighting took place. 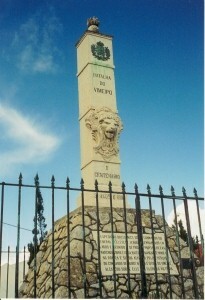 Left: The monument on Vimeiro Hill. The remainder of the battlefield can be explored by taking the road below the Ventosa ridge through Toledo. Take the left turn to Pregança just ahead of the major road junction, then left and left again following directions to Ventosa. The mini-roundabout at the entrance to Ventosa is close to the head of the ravine which forced Brennier and Solignac to march further north than planned. A good view of the ravine can be obtained just south of the mini-roundabout. Return to Vimeiro by turning left in the centre of Ventosa. Detailed map of the Battle of Vimeiro courtesy of The Napoleon Series.